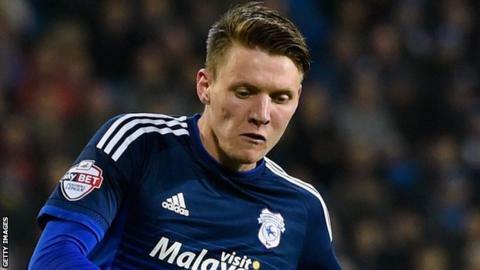 Cardiff City will want at least £5m for striker Joe Mason, BBC Wales Sport has learned. The 24-year-old is understood to have attracted interest from Championship rivals Wolverhampton Wanderers. But a senior Cardiff source has indicated the Bluebirds will want "at least £5m or £6m" for the former Republic of Ireland Under-21 forward. Mason joined Cardiff from Plymouth Argyle in 2011 for £250,000 and has scored 22 goals in 60 League starts. This season Mason has chipped in with six goals, enjoying a prolonged run in the team having had three loan spells at Bolton Wanderers during previous campaigns. Cardiff are under a transfer embargo, but chief executive Ken Choo made it clear the club would not be forced to sell their best players as a result of the restriction. The club are also looking to draft in at least three players on loan. Mason and midfielder Joe Ralls, 22, are seen by the club as prized young assets.